The following consists of the Super Mario Odyssey Hats. It shows all of the obtainable Hats in Super Mario Odyssey that change Cappy's appearance. The following consists of the Super Mario Odyssey Hats. It shows the obtainable Hats in Super Mario Odyssey. Majority of the Super Mario Odyssey Hats can be bought from the Crazy Cap Shops found in various Kingdoms. Below includes the Details and location for each hat. Note that Super Mario Odyssey Hats change Cappy whenever Mario decides to wear a different cappy hat. 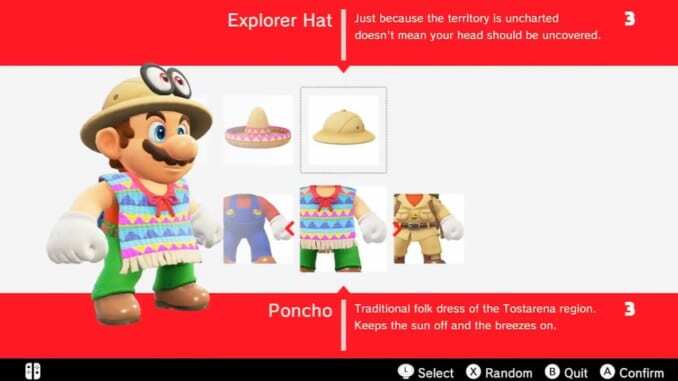 The Super Mario Odyssey Hats are located all over the kingdoms of the game and can be retrieved by purchasing them on available stores in the different kingdoms of Super Mario Odyssey. Whether you’re building or inspecting, you gotta keep your head safe. Just because the territory is uncharted doesn’t mean your head should be uncovered. Anyone wearing one of these makes many friends on Mount Volbono. The perfect hat for pratfalls, teeny cars, and wasting good pie. A red hat that has seen its fair share of adventures. A good hat to wear when it’s time to get down to work. Is it even really painting when you’re not wearing one of these?